There were two bunkers beneath the Reichs Chancellery building in Berlin. 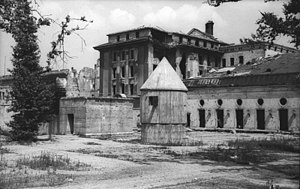 The older one, the upper bunker, had been designed by Albert Speer as an air raid shelter in the early 1930s. It was built beneath the cellars of the old Reichs Chancellery and was ready for use by 1936. A lower bunker, which became known as the Führerbunker, was constructed in 1944. It was located 8.5 meters below the garden and protected by a 3-metre-deep concrete roof. During January 1945 Hitler slept in the Führerbunker but worked in the remaining rooms of the Reichs Chancellery. In the early afternoon of the 3rd February 1945, the US Air Force undertook a mass bombing attack on Berlin, creating a fireball which burned for five days and inflicting the worst damage that the capital had yet suffered. From his point Hitler stayed underground. Most of the senior Nazis had sent their families to safety and had removed out of the capital. Joseph Goebbels remained in Berlin, sleeping in a luxurious bunker built beneath his family home.The Head of the SS Heinrich Himmler, had been living in a sanatorium in in the beautiful resort of Hohenhychen since January, receiving treatments for stress and severe stomach pain. Himmler held a very inflated view of himself as a figure of international stature and had become convinced that he was the best person to negotiate the peace and lead Germany into the future. At the suggestion of his Swedish masseur. Felix Kersten, who took advantage of his relationship with the SS chief to try and get concentration camp prisoners released. Himmler had two secret meetings: One with Count Folke Bernadotte, a Swedish diplomat and one with Norbert Masur, the Swedish representative of the world Jewish Congress. Ostensibly the purpose of both meetings was to discuss the release of prisoners, but Himmler's motive was to open up a channel of communication with the Western Allies, He hoped that Masur would put the issue of the Final Solution behind him. On the 11th March 1945 there was a service of remembrance for the war dead in the village of Markt Schellenberg, close to Hitler's mountain retreat Obersalzberg. At the end of the speech the local Army Commander called for a 'Sieg Heil' to the Führer. There was a deadly silence. None of the civilians, Home Guard or Soldiers responded. On his cold morning everyone kept their mouths shut and their right arms tightly by their sides. 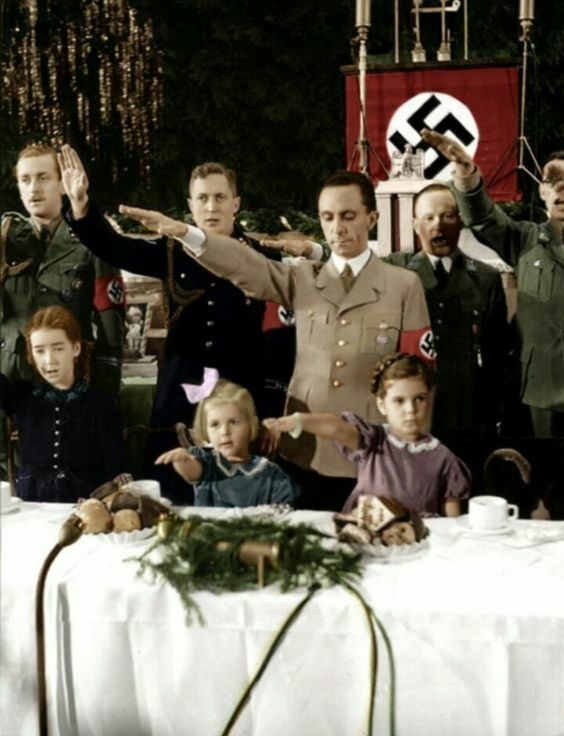 At hundreds of rallies held during the previous 12 years these people, and millions of others, had leapt, mesmerized, to their feet to 'Sieg Heil' the close of Adolf Hitler's rousing speeches. But the spell had been broken. In the following days the Russian Army encircled Berlin and entered the suburbs. An attempt by Göring to clarify his position as Hitler's successor triggered one of the Führer's ferocious outbursts and Göring's dismissal as head of the air force. Hitler felt betrayed on all sides. He blamed the disaster of the war on the incompetence of his generals, and ultimately a failure of the German people. When he learned about Himmler's attempts to negotiate with the West he turned purple with rage and ordered his arrest and execution. That evincing, 28th April 1945, Hitler started to get his personal affairs in order. He instructed Joseph Goebbels to find an official with the authority to conduct a civil wedding and to source some wedding rings. After a lifetime insisting, for me marriage would have been a disaster... it's better to have a mistress. Hitler had decided to marry Eva Braun the women who had been his secret mistress for 14 years. He the asked his secretary Traudl Junge to take down his final testament and will. Adolf Hitler. who for the past 12 years had kept Germany under his spell, who had masterminded some of the most extraordinary battles in modern history, was preparing to end his life. The following is the story of Monday 30th April, the day Hitler commits suicide, and also the day before, when so many extraordinary things happen both inside the bunker and across the world that help place that last day in context. Eva Braun is in her bedroom having her hair done by her maid. Liesel Ostertag. Braun keeps it lightly peroxided, cut in short waves, with her long fringe pinned up on the right side. Her face is carefully made up to look natural, as Adolf Hitler likes it. She has chosen her outfit: a long black silk taffeta dress which she is going to wear with her favorite diamond watch, a gold bracelet with pink tourmaline gems and a topaz necklace. She decided on some black suede Perragamo shoes, one of the scores of pairs she has bought from the exclusive Italian designer since her first visit to Italy in 1936. She wants to look her best. Tonight she is marrying the man she has loved since she was 17. They have been conducting a secret love affair for the last 14 years. Braun's room is the most comfortable in the bunker complex. She has furnished it entirely with pieces designed for her by the architect of the bunker, Albert Speer. As well as the dressing table and chair, there's a straight-backed sofa, upholstered in a floral fabric, a wardrobe and a single bed. Everything is marked with her four-leaf clover monogram, also designed by Speer, the two sides of the clover created out of curved E facing a curved B. Her monogram is stamped on the furniture, embroidered on her clothes and engraved on her silver combs and brushes, on her jewellery and on the broach-clip which Liesel is pinning into her hair. He boasts how he has forced the Jews to pay for all the suffering they have caused: 'I...leave no one in doubt that this time, millions of children of Europe's Aryan people would not die of hunger, millions of grown men would not suffer death,and hundreds and thousands of women and children not be burned and bombed to death in the towns without the real culprit having to atone for his guilt,even if by my more humane means'. Hitler barely looks up as he dictates. He nominates a successor government with Grand Admiral Dönitz, the head of the navy as its leader. Hermann Göring, head of the Luftwaffe, and Heinrich Himmler, head of the SS, are formerly expelled from the Party and from their posts for negotiating with the enemy without my know;edge and against my wishes'. The list of new appointments is long. As she jots down the names in shorthand, Junge can't understand the point of all these appointments if, as he insists, all is lost. The Führer pauses briefly and then launches into the dictation of his personal will. He sets out a number of legacies and then explains that he has decided to 'take my wife the young women who after long years of friendship voluntarily came to this practically besieged city in order to share her destiny with me'. The news shocks Junge, Hitler has always insisted he will never marry because women have a destructive influence on great men. Hitler regarded it as a crucial part of his public persona that he was a single man, devoted to his country and without a wife standing in the way of the fantasies of the women of Germany. He continues, 'I and my wife choose death in order to escape the shame of deposal and surrender. It is our will that our bodies be burned immediately in the place where I performed the greatest part of my daily work in my 12-year-long service to my people'.